As a person who cuts hair for a living, I tend to be a bit biased against products intended to promote home haircutting. That said, I put the Wahl Deluxe Chrome Pro Complete Haircutting Kit to the test in a professional environment and found the clipper to be a capable performer. The accessories, on the other hand, did nothing at all to complement this otherwise fine clipper. The Wahl Deluxe Chrome Pro Complete Haircutting Kit includes everything you need to do a complete haircut. There's the Chrome Pro Clipper, a small battery powered trimmer, scissors, combs, cape, clipper guards, and even a storage case -- 27 pieces in all. At around $68 suggested retail (you can find it much cheaper online), the kit is a pretty good deal for those brave enough to take a stab at home haircutting. 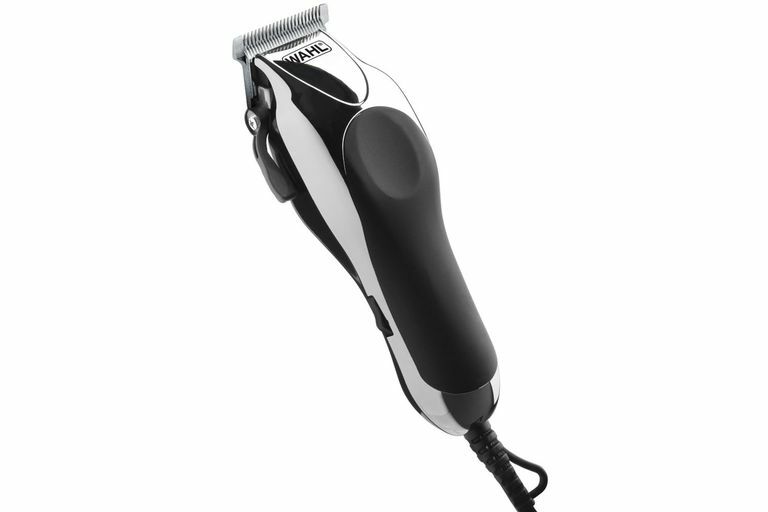 The clipper is a solid performer and the trimmer is fine for home use. The accessories, while probably okay for home use, leave a great deal to be desired (more on that later). I was actually impressed by the Wahl Chrome Pro Clipper and found it to be one of the finest consumer-grade clippers I've ever handled. The rugged plastic bottom felt strong and solid, much like you'd expect from a progressional grade unit. The thinner top plastic "chrome" plate felt cheap, but it should hold up well under home use. In a heavy-volume barbershop environment, it held up quite well. The carbon steel blades provided a smooth cut and the clippers ran cool and quiet. For home use, the haircutting clipper will certainly be a solid performer and more than capable of buzzing some heads for years to come. The included battery-powered trimmer proved itself to be a fine performer for home use. The trimmer didn't cut as closely as you'd like, but for outlining and trimming up those stray hairs during a home haircut, it should be perfectly fine. While the Wahl Chrome Pro clipper and the bundled trimmer were solid, the accessories leave a lot to be desired. Besides the clipper, the guide combs are the most important element in a home haircutting kit and these were among the cheapest and flimsiest I've encountered in over two decades of cutting hair. A few of the guards, which seemed to have been thrown haphazardly into the kit, were bent and had to be straightened out. They also didn't seem to be a solid fit on the clipper -- one of the larger combs popped off when it made contact with the client's head. If one were to pop off in the middle of cutting, you'd have a huge bald patch to contend with. If you do purchase this kit, pick up a set of professional ​Speed-O-Guide attachments -- these are sturdy, inexpensive, and they pop off in the middle of a haircut. While the kit includes ten guide combs in lengths ranging from 1/8" to 1" (and right and left ear taper guides), I can't confidently recommend them. The other accessories include a small spray bottle, the tiniest little mirror ever made, a plastic haircutting cape (that looks like a white garbage bag), combs (also flimsy), oil, and instructions. It's almost as if Wahl decided to throw all of this crap into the package to give the illusion of value. Yes, it looks good on the box, but the accessories are insulting to an otherwise fine clipper. If Wahl really wanted to include accessories worthy of this clipper, perhaps a set of their color-coded guide combs, a cloth cape, and maybe a copy of the Wahl Home Haircutting Made Simple DVD would have been a better fit. People may even be willing to pay a bit more for a kit with some solid accessories. While the Wahl Deluxe Chrome Pro Complete Haircutting Kit contains a solid clipper and trimmer, the accessories leave a lot to be desired. Pick up the Wahl 5-Star Trimmer outside of the kit (about $35 online) and invest in a quality set of attachment combs like the Wahl Color Coded Guide Combs or Speed-O-Guide. Of course, it's best to actually go to a barber or stylist and get a professional haircut -- the results are almost always better than what you'll get at home. Doing a great haircut takes proper training. That said, if you're looking for a quick, inexpensive home buzz, then the Wahl Chrome Pro Clipper and Trimmer will do the trick just fine and save you some dough in the years to come.